Located in the new Kroger Shopping Center at University Blvd and LJ Pkwy one-mile West of Hwy 6 Target & Home Depot. 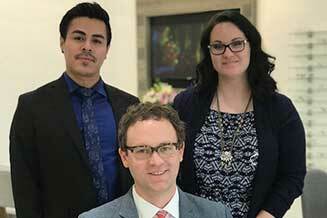 Our Sugar Land Eye Doctors and Staff are trained professionals - ready to help with your Eyecare and Eyewear needs. Made to represent Texas. Contemporary fashion frames with the spirit and passion of Texas. Order online directly. 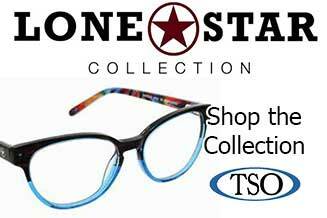 TSO Riverstone provides total Sugar Land eye care for the whole family. We carry top of the line technology to ensure your healthy vision. The Sugar Land eye doctors at TSO Riverstone believe in looking at the big picture when it comes to your eye health, so we take the time to get to know you, your eye care history and your vision needs. Our Sugar Land eye doctors know that getting the right prescription involves balancing several factors, including clear eyesight, visual efficiency and your ability to process visual information seamlessly. Whether you need a routine eye examination, an eyeglasses fitting or treatment for eye disease (such as glaucoma or macular degeneration) or eye surgery (such as LASIK or cataract surgery), our optometrists will provide you with the best care, advice, options and follow up. 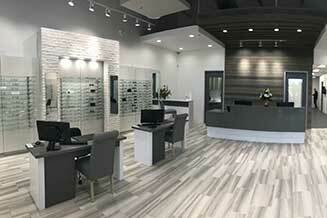 We at the Sugar Land eye care center is ready to meet eye care needs. Schedule an appointment with a Sugar Land optometrist to see how we can help you get the most accurate prescription for your eyes. SEE WHAT OUR PATIENTS HAVE TO SAY. 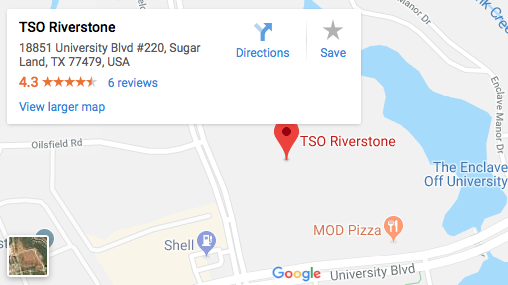 I received excellent service at this brand new TSO location in the heart of Riverstone community. Dr. Underwood is an excellent Optometrist. He fitted me with the right set of contact lenses to meet my needs. The staff is very friendly at this location. A great addition to the Riverstone community. My experience with Dr. Underwood and his staff has been very positive. Dr. Underwood is an excellent Optometrist and pays great attention to his patient needs. Both his staff Felix and Victorya are very friendly. I had great and very thorough examination by Dr. Underwood. I had help in selecting my frames and I thought the facility and the staff were very professional and friendly. It is a new TSO location so I believe they are still working out some kinks but my experience was excellent. Conveniently located on 18851 University Blvd, the TSO Riverstone eye care center is open 6 days a week. Call us to make an appointment with our Sugar Land eye doctors to talk about your eyeglasses, contact lenses or specialty lens needs. Or just drop in anytime to browse through our Sugar Land eyewear store’s large selection of designer eyeglass frames or sunglasses. Our purpose is to serve you and help you see the important things in life. What can I do to prevent Dry Eyes? Dry eye problems can occur as a result of many different factors. Here are a few things that patients can do to minimize the symptoms. Eliminate as many household allergens as you can. Turn off ceiling fans when possible. Run a humidifier to put moisture back into the air..
Add more omega-3 fatty acids or fish oil supplements to your diet. Use lubricating or rewetting eye drops.